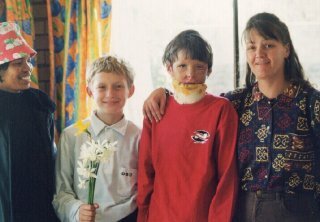 2003 was a year when we helped burns survivor Jaun in many ways. He is pictured here with a child care worker, his mother and Tristan Jones, the charity's longest-serving volunteer. He was severely burned due to an electrical fault that led to a house fire, but was lucky enough to be admitted to a private hospital and to have the best surgery that South Africa could provide at that time.